My granny (or Ah Mah as I call her) is one extremely simple lady. Her attire is simple one-design blouse and pants, only in different floral patterns and colours. Her hair is always in a small bun. She uses one piece of soap for her entire body and face. Her beauty ritual? Almost non-existence. BUT... she has one simple beauty ritual that she practices each day without fail. She applies homemade bedak sejuk on her face, décolleté, hands and legs after each shower. Bedak sejuk is fermented rice powder, made from fragrant white rice soaked in water for 6 months or more until all the rice is dissolved into powder. The fermented rice powder is then dried out in the sun for a day and kept in an air-tight container. She often takes a small piece of the bedak sejuk on her palm and dilute it with few drops of water before applying it all over her body. At 79 years old and for a person who doesn't use any kind of lotion, she definitely has GREAT skin (think Carmen Dell'Orefice)! 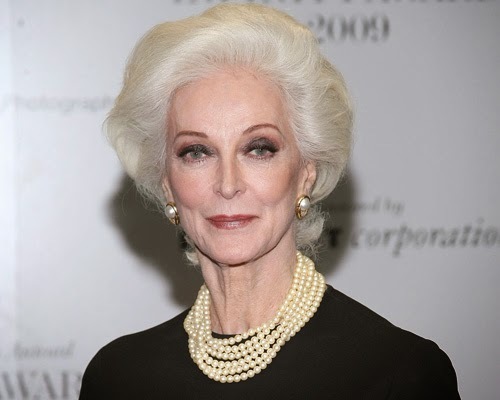 Carmen Dell'Orefice. 78 years old. Photo taken from Huffington Post. Read more on how to make your own bedak sejuk.